Simply stated, if a husband dies, the widow is no longer under the law (verse two). The first half of verse three states that if the husband is alive, she is an adulterer. The second part of verse three states again that if the husband is dead, the law allows her to remarry. Separating verses one through three from verses five through six creates two comprehensible thoughts: the first allegory of spouses and the new covenant, the second is how followers of Saint Paul have died in Christ and are no longer subject to the law. Verse four states that followers are "dead to the law" and that they "should bring forth fruit unto God." 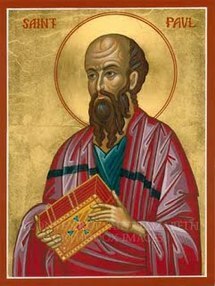 This reasoning is similar to other passages in Saint Paul's writings and there is no reason to think that this passage was inserted by Timothy or anyone else. "Know ye not... how that the law hath dominion over a man as long as he liveth?" A person is subject to the law as long as he is alive and at death he is free from the law. The law can either be religious or civil and we accept this statement at face value without any need to prove the validity of the statement.